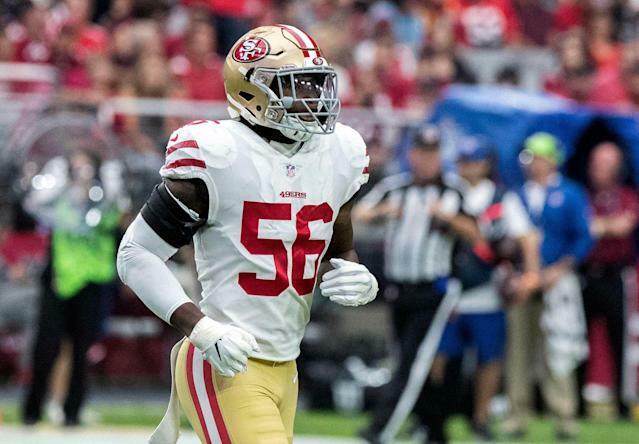 Reuben Foster was cut by the San Francisco 49ers for an incident in Tampa last season in which Foster was arrested, but the NFL found there was no reason to suspend him for it. However, strangely, it did find that Foster was guilty enough of something to fine him two game checks. The NFL announced its decision just before the end of the business day on Friday. Foster, an inside linebacker who was claimed off waivers by the Washington Redskins in a controversial transaction, was arrested last November on suspicion of domestic violence battery before a 49ers-Tampa Bay Buccaneers game. Foster, who had previously served a two-game suspension that stemmed from an incident with another domestic violence allegation, was arrested on Saturday before the Bucs-49ers game and cut the next morning. Despite taking a lot of heat for claiming Foster after he was cut, the Redskins won’t have to wait for Foster to serve a suspension. “Today, the NFL notified Reuben Foster of the Washington Redskins that he will be fined two game checks following a review of recent incidents and an assessment of his adherence to obligations arising from previous violations of league policies. Following a thorough investigation, the evidence did not support a finding that Foster violated the NFL's Personal Conduct Policy in connection with the Tampa incident in November 2018. The NFL has returned Foster to the active roster from the Commissioner Exempt list. He may fully participate in all team activities. In 2018, Foster was accused of dragging his then-girlfriend Elissa Ennis, and punching her in the head multiple times. Charges were dropped when Ennis recanted her story. Foster was suspended two games for misdemeanor gun charge and a misdemeanor marijuana possession charge, which was dropped, stemming from that incident. The NFL investigated and found no evidence that Foster violated the personal-conduct policy, though he’ll have to play for free for the first two weeks of the season. Foster said: "I am grateful to the Washington Redskins and the NFL for giving me this second chance. I appreciate the support I have received from the league, my team, and my union to help me succeed. I want to thank Commissioner Goodell for the time that he has spent with me and for his understanding of me as a person. I accept the NFL’s decision and want to say that I am truly sorry for my past actions and the people who may have been hurt by them. Going forward, I will follow the plan outlined for me and work hard to earn back the trust of my teammates, the NFL, NFL fans, and the community. I know that my success is all up to me, and I am committed to not letting you down." Allen said: "Everyone in this league is held to a higher standard. Reuben understands that his past actions have led a lot of people to doubt him, and he has committed to doing the work necessary to earn the trust of his teammates, our great fans, and the NFL. "The Redskins have put in place a comprehensive responsibility and accountability plan to help Reuben be successful on and off the field. Elements of this plan include individual counseling, a structured living arrangement, weekly meetings with the club player engagement director, weekly meetings with our team chaplain, and targeted community service engagements.